On July 11 at 03:45 UTC (1:45 p.m. EDT Guam local time/), the Moderate Resolution Spectroradiometer or MODIS instrument that flies aboard NASA's Aqua satellite captured a visible image of Tropical Storm 09W (09W) over Guam. The MODIS image showed a concentration of strong thunderstorms around the center of circulation, and in a large band circling around the western quadrant and spiraling into the center. On July 11, a tropical storm warning was in effect for Guam, Rota and surrounding waters out to 40 nautical miles. A tropical storm watch continued for Tinian, Saipan and surrounding waters out to 40 nautical miles. On July 11, the Governor of Guam declared Tropical Storm Condition 1 as of 8 p.m. CHST (local time). At 1200 UTC (8 a.m. EDT/10 p.m. CHST-Guam local time) Tropical Storm 09W's maximum sustained winds were near 40 mph and the National Weather Service expect winds to increase over the weekend of July 12-13. For updated forecasts, including warnings and watches, visit the National Weather Service Forecast Office in Tiyan, Guam website: http://www.prh.noaa.gov/pr/guam/. The MODIS instrument aboard NASA's Aqua satellite captured this visible image of Tropical Depression 09W over Guam on July 11 at 03:45 UTC. 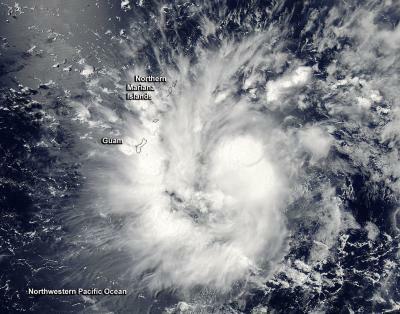 The center of Tropical Storm 09w was located by satellite near latitude 13.0 north and longitude 146.1 east. That puts the center of 09W about 165 miles east-southeast of Guam, 155 miles southeast of Rota, and 185 miles south-southeast of Tinian and Saipan. Tropical Storm 09W is moving west-northwest at 14 mph and is expected to be very near Guam early on July 12 (local time). The U.S. National Weather Service forecast office in Guam expects that general motion is expected to continue through July 12 before 09W turns gradually westward. 09W will likely be renamed "Rammasun" from the World Meteorological Organization's Western North Pacific and the South China Sea Names list. The Joint Typhoon Warning Center forecast calls for 09W to strengthen into a typhoon after passing Guam and continue on a westerly track, approaching the northern Philippines around July 16.